Vermilion is a town in central Alberta. It is located at the intersection of the Yellowhead Highway and Buffalo Trail, approximately 60 kilometres west of Lloydminster and 192 kilometres east of Edmonton. 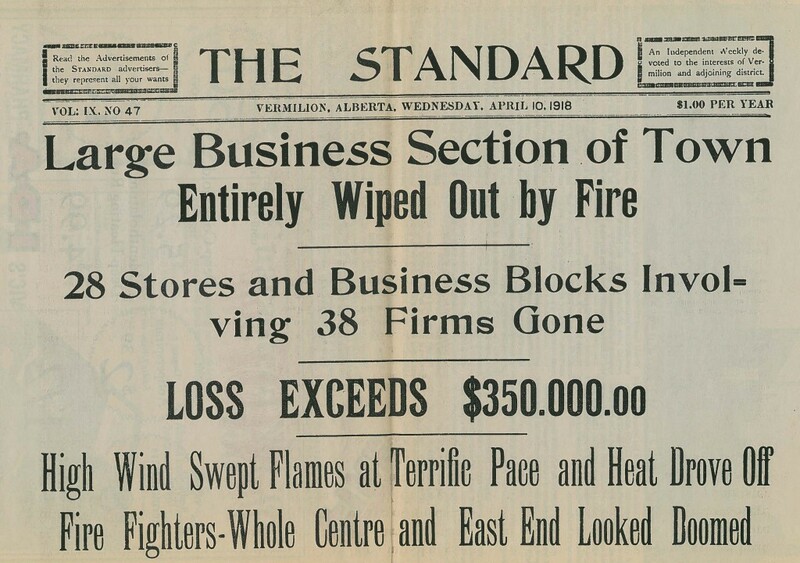 When the Great Fire of 1918 wiped out most of the business district, the call went out across Canada for manpower to help rebuild the town. Richard Rodgers Brennan from the Eastern Townships of Quebec was one of many who responded. With all this help, the town was rebuilt in short order. Richard, a blacksmith by trade but also a "jack of all trades", stayed on in Vermilion and bought a quarter section just west of the town. His skills can be attested by the fact that George Dollman, with a farm to the north of town would bring his standard bred mare "Red" to Richard Brennan, a skilled farrier, to have her shod. He decided on dairy farming and the first barn with 20 stantions was built in 1918. 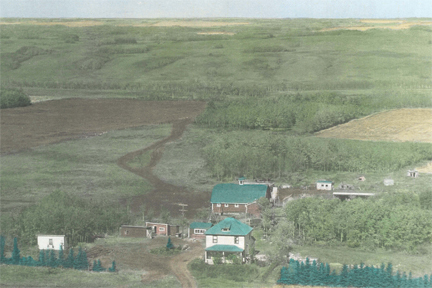 (The Photo on the left below shows the farm with the original barn.) The barn was enlarged after 1956 to 36 stantions when a barn from an adjoining section was purchased and added to it. The dairy farm ceased operations in the 1960's and the barn was finally torn down in 2010. Painting of the barn with the barn added from the adjoining property. 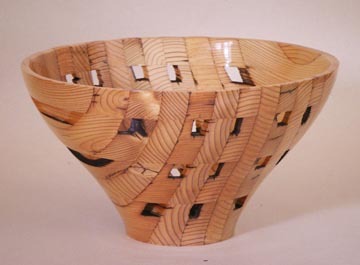 A number of years ago I was commissioned to make some pieces from wood provided to me from Richard Rodgers Brennan's barn. The first material sent to me was weathered cedar siding. The siding was thicker at one edge than the other. 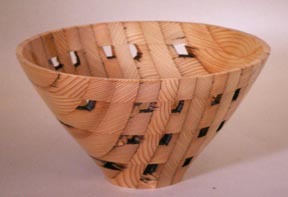 Although the wood wasn't really worth much for making anything, I am always game for a challenge. Now, in 2014, I still have some of this wood in my studio. To be sure, for the commission, I used the best pieces. There was enough wood left to tempt me to make another stab at making something nice from what was basically the rejects. 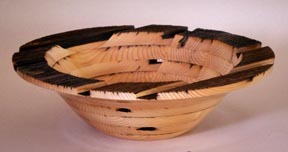 Having received permission to use the wood, I mulled over the possibilities. In the video at the right, I am revisiting the siding and thinking back to that original piece. 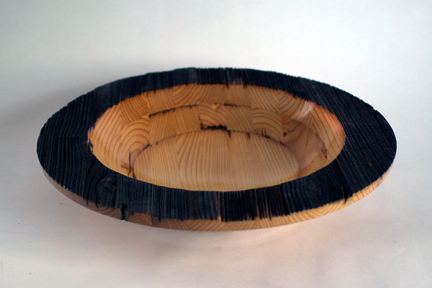 However, over the years, I have become much more aware of the texture of the wood and to make a piece similar to the first one would mean hiding away all those beautiful weather-worn surfaces. This led me to start formulating a new plan that might incorporate the weathered surfaces of the siding. In this video I look down the road a bit and try to anticipate some of the obstacles I might face. I am also just starting to get an inkling as to how much work would be entailed in making the piece. An idea starts to form. Here I talk about how I can incorporate the siding and the larger boards into one piece. The construction of the piece is going to be complex and it will be something I haven't done before. The outcome is not assured. Texture wins and I opt for a simpler piece. In this video I explain why I have reached this conclusion and what the finished result will be. I thought at the time that this approach might be more work than the previous idea but in retrospect, it was work that I had done many times before so not as much new thinking was involved. 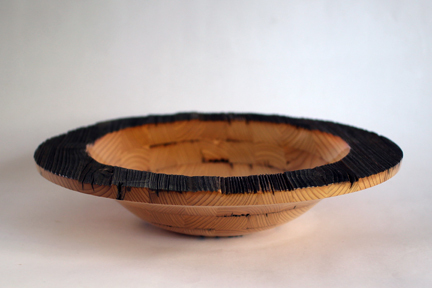 When you touch the rim of this bowl, you are touching the original surface of the wood used to construct the barn of Richard Rodgers Brennan almost a hundred years ago in 1918.